Living in the UK’s second city, I sometimes take for granted how many great pies I have on my doorstep in Birmingham. Sure, it’s never going to match London for the number of pie shops – especially with a lack of Traditional London Pie and Mash shops! 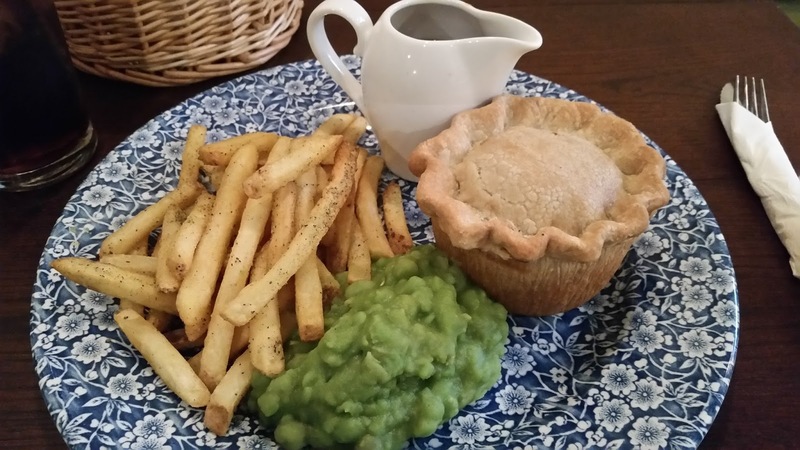 - but there are certainly more than a fair share of pie pubs in Birmingham! 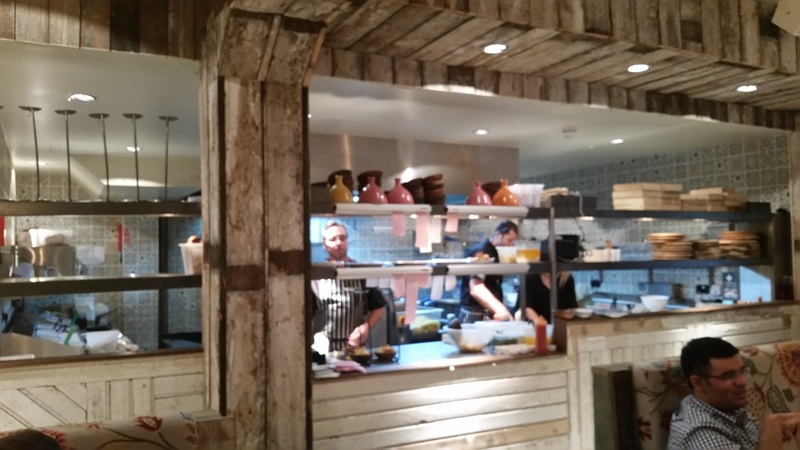 And one new pie provider on the market in Birmingham is The Botanist. Opened in March 2015, The Botanist has already become a top spot for the trendy young professionals of Britain’s Second City. Following a £1.2million refit of Cheltenham House on Temple Street in the City Centre, the Botanist boasts a wide range of “home comforts” – which of course makes it no surprise that they have a range of pies on the menu. Four, in fact, when I visited this weekend just gone. 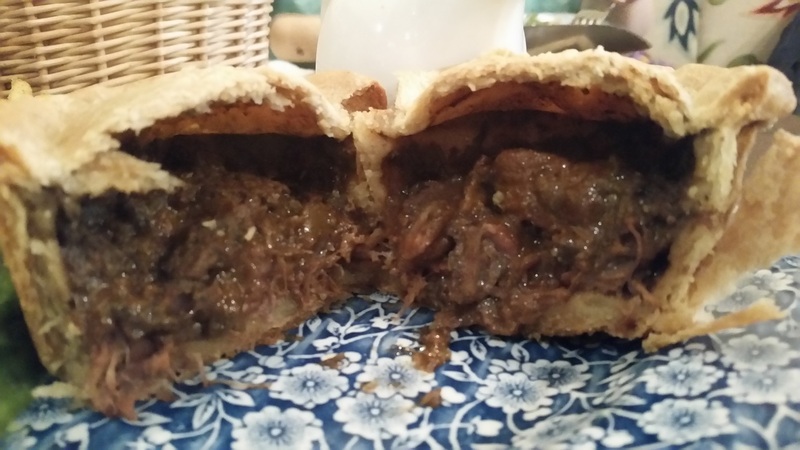 Having already tried the Lamb Hotpot pie a few months back when The Botanist had only recently opened, a mash-topped pie review I will get to shortly, I returned again on Sunday and had a much more enjoyable ex-pie-rience in the form of a fully encased Steak and Stout pie. It is worth noting that The Botanist is one of the most beautifully decorated restaurant venues I have ever eaten in, especially in Birmingham. It’s really clear how much thought and time has been put into the small details here, all keeping brilliantly to the flowery theme. Drinks served in watering cans and flower pots, plus starters served in trowels, give an indication of the quirky attention to detail put into the décor and the live music is another of the many things going right for the place. They've clearly planted a great idea and it’s now blooming. The Botanist Kitchen - Where the magic happens! 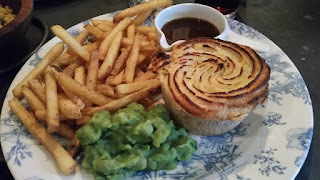 I must however confess therefore that while I did enjoy the Steak and Stout pie at The Botanist, it did struggle to live up to the high standard set by the décor and friendly staff. The pie came out on a flowery plate and was well presented, but it was rather pale and the pastry crumbled quite easily upon cutting. Opening the pie up, the capacity was quite limited – approximately half filled – and by the end of the meal there was definitely a poor filling:pastry ratio, with a reasonable amount of left over pastry. It was a shame really, because the filling itself was quite nice. 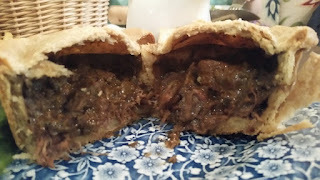 The meat was lovely and flavoursome – even if I have preferred some other steak and ale pies to this stout filling – and I was therefore longing for a more meatilicious content to the pie! It was quite consistent throughout, with very little padding out. I would therefore happily eat this pie again, but would want a meatier filling for piefection. At £10.95 for the pie meal of pie, chips, mushy peas and gravy this was quite a reasonable price for the meal in lovely city centre locale but I have had better value restaurant pies for the price. 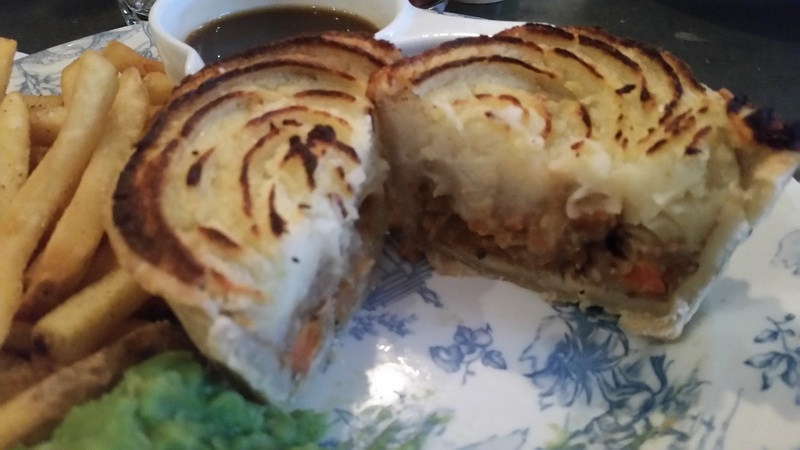 The Lamb Hotpot Pie was eaten a few months ago with pie friends Caroline and Justin. However there was an unfortunate mix up with the waiter, because even though I had checked with him all the pies were fully encased (having had a hunch this lamb hotpot pie might have a more potato bias) I was assured they were and yet was still presented with a mash-topped Lamb Hotpot pie! Lesson learnt: Always trust your pie instinct!!! It cannot however take away from the fact it was a very nice meal, even if I again thought the pie was a bit lacking in meaty content. The lamb however was very nice and the flavours of the pie worked well together. It cannot however compare in capacity and condition to a fully encased pie offering, meaning although this was a nice meal, it was not really a proper pie. There was also too much potato in this meal, with the very nice chips adding to the potato topping the pie to be a bit of a carb overload. There was also a lack of gravy in the pie, so while it was moist it could have been a little more gravy focused. Once again I would eat this meal a second time, but would not call it a pie! All in all, I have to say that The Botanist is a lovely place to visit and eat in – somewhere I hope to visit many more times in the future. It does sell some decent pies, though they perhaps aren’t the pie-light of the menu and staff perhaps need to do a bit more digging around if they are going to plant an award-winning pie we would highly recommend! Just goes to show how hard it can be trying to reach piefection!